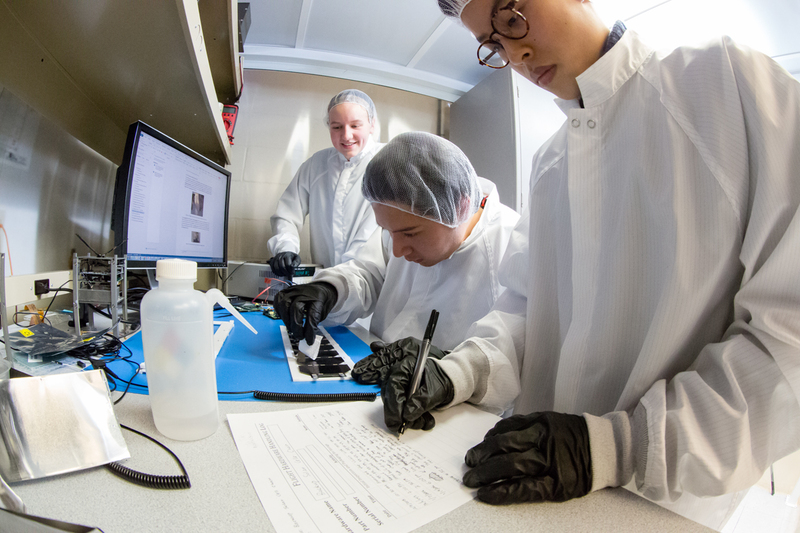 Students Dawn Haken, José Tuason and Osamu Miyawaki work on assembling and testing solar panels that will provide power for a CubeSat mission slated to launch in the fall. For many students, being part of a real space mission is a dream for the future. For students in ENG 491, course devoted to design, construction and launch of small, cube-shaped satellites, it’s a typical day in class. The cross-disciplinary course, housed in the College of Engineering, gives students the opportunity to design, build, test and launch CubeSats for various scientific missions supported by NASA and the National Science Foundation. A CubeSat is a small satellite within a cube-shaped housing with sides about four inches long. “It’s much easier to teach somebody the importance of principles and theory when you can give them a concrete, real-world example of why it’s useful,” said Erik Kroeker, the head teaching assistant and an instructor for the course. The CubeSat course is a hybrid between a senior design course and a practical lab course, the instructors said. The Illinois CubeSat project began in 2001 as a collaboration between electrical and computer engineering professor Gary Swenson and aerospace engineering professor Victoria Coverstone. They began with a few students as an independent project, then developed a full-fledged hands-on course. Currently, the students are working on two missions. The first, called CubeSail, will deploy a solar sail between two CubeSats. The solar sail will reflect sunlight to propel the satellites. Most solar sails are square, but CubeSail will be a ribbon, so it can twist and spin like a windmill. The hope is that, eventually, multiple such solar ribbons can be deployed with CubeSats on the ends to form a large, steerable space windmill for deployment to the outer solar system. The second mission, slated for fall 2016, will launch a six-cube compound satellite to study phenomena that cause glowing in the lower atmosphere – the northern lights, for example. The satellites will orbit in search of such events and take samples of the particles involved. Students learn how to create or revise detailed design features, user’s manuals and testing procedures. The lab has equipment for testing components under spacelike conditions, such as within vacuum, in subzero temperatures or exposed to unfiltered ultraviolet radiation. Case enjoyed participating in the CubeSat course so much that he founded a club, the Satellite Development Organization, in his junior year so that students at any level in any major could be involved. He envisions it as a track that would allow students to gain some experience as freshmen andsophomores before taking the course as upperclassmen. The students are assigned to specific teams within the CubeSat projects, for example, power systems, mechanical housing, electrical components and other elements of satellite design. However, assembling a complete, working satellite requires cooperation among all the teams, exposing the students to other specialties as well as their own. The rigors of the course and the emphasis on real, launched missions is what sets the Illinois CubeSat program apart from other universities that treat satellites as toys or independent clubs, Ghosh said. Recruiters and companies that have hired Illinois CubeSat graduates have been impressed by how well prepared the students have been, Ghosh said, citing their hands-on experience and detailed documentation skills. “In every job interview I’ve had, when I mention I’ve actually been in a real lab working on real satellite hardware, they can’t believe it,” Case said. “They assume we’re just doing math on paper for homework assignments. It’s been really fun, really beneficial, and it’s something that most students don’t have the opportunity to do.